There certainly isn’t a shortage of hiking trails throughout the state; and for those who are looking for a trail that offers ever-changing scenery and terrain, there’s plenty of circuit hikes available for all hikers. Circuit hikes vary in many degrees of difficulty, making for unique experiences around the loops. Here’s some of the trails around the state, with many more to discover along the way. Tell us about your favorite circuit trail! Old Rag Mountain is one of the most popular hikes in the Shenandoah National Park—it is also the most challenging and dangerous. Recommended for experienced hikers only, a day on the Old Rag is one of Shenandoah’s premier experiences. The circuit is approximately nine miles, with significant elevation changes and rock scrambles. Hikers should allot about 7-8 hours to complete the loop. This family and pet-friendly refuge offers an easy 2.3-mile trail, covering the length and flatness of the shore along Belmont Bay. Spotting bald eagles and other bird species, as well as other wildlife make for a great hike! Pack a lunch and take a break at one of the trail’s shelters or snack on the beach! Plan for 1-3 hours for the hike along the Mason Neck National Wildlife Refuge and experience the serene undisturbed land of the refuge. Stratford Hall’s nature trails are as varied as they are scenic, providing leisurely strolls for the amateur hiker and challenging treks for veterans. Hikers have six trails to choose from, including the Spring House Trail loop. The short and easy hike, approximately a quarter-mile, passes through a natural spring and is home to many species of wildlife—in particular the American Bald Eagle. A bald eagle can be spotted regularly and in rare instances, hikers may see a pileated woodpecker. The pileated woodpecker is the only woodpecker that can carve out a nest cavity in a living tree. Sky Meadows State Park offers more than 17 miles of hiking trails that are accessible for the novice to expert hiker. The park’s long circuit trail is a moderate hike, about 8.5 miles long. Much of the loop meanders across or skirts the edges of rolling meadows and offers up to four vistas along the way. This circuit is a great hike for the entire family. 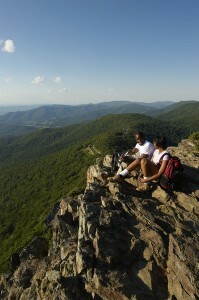 The Stony Man Mountain Trail is one of the most scenic circuits in Shenandoah National Park. Although Stony Man is the second highest peak in the park, the grades are not difficult. The trail offers outstanding panoramas of neighboring mountains and totals 3.4 miles in length. Take a step back in time at First Landing State Park. More than 19 miles of trails wind through the park, where English settlers established the first elective government in 1607. The South Loop trail allows hikers to explore the rich history of the area, including lagoons, large cypress trees and rare plants. In the heart of Goshen Pass, the Laurel Run Trail makes for a good hike along a beautiful small native trout stream. The trail boasts waterfalls, seasonal rhododendron and mountain laurel displays. The beautiful scenery makes this 3-mile round trip hike most enjoyable. The moderate skill-level trail is great for the beginner hiker who is looking to get a more challenging experience out of their journey. Located within the Shenandoah National Park, Lewis Falls Trail is a 3.3-mile circuit hike from the Big Meadows amphitheater to the observation point, or 2 miles round trip from Skyline Drive. It boasts an 81′ waterfall, streams and more. The hike is moderate, with steep rocky areas and different variations of terrain throughout. Locher Tract is an easy, 1-mile loop along the James River, which used to be the site of an old family farm. The U.S. Forest Service now maintains the area for wildlife watching. While you’re trekking the loop, look for beaver, deer, herons, quail, turkey and more. The trail loops past an active beaver swamp, piney woods and grassy openings. Hiking South River Falls and Pocosin Mission is a long, historic trek, measuring about 8.5 miles. Venture to the third-highest waterfall in Shenandoah National Park, with a drop of 83 feet. The total climb is about 1,830 feet and hikers should allow 7.5 hours to complete the loop. The hike also includes views such as settler ruins, a cemetery and more. Humpback Rocks, located within the Blue Ridge Parkway, features three trails (along with the Appalachian Trail) that make great circuit hikes. The complete circuit includes both blue-blazed spur trails and the rerouted Appalachian Trail, which totals just under 6 miles. Enjoy some truly amazing panoramic views of the valley on top of the slanted rock. Limberlost Trail, also located within Shenandoah National Park, is often enjoyed by people with mobility challenges. The trail was originally constructed to meet ADA accessibility standards; however, the requirements have recently been revised. Shenandoah National Park has plans to upgrade Limberlost to meet the new standards. This circuit hike of 1.3 miles is for people of all ages and has a 5-foot-wide crushed greenstone walkway on a gentle grade with frequent benches, a boardwalk, and a bridge. The trail passes through forest and a stand of mountain laurel – stunningly beautiful when it blooms in June. This trail starts easy at the entrance to the Rocky Knob campground on the Blue Ridge Parkway. Then descends over three miles into the backcountry camping area in the bottom of the gorge. The strenuous and rugged nature of the trail reveal part of the reason this pathway was given National Recreational Trail status. In the springtime to early summer, nearly 200 varieties of wildflowers are visible along the trail area. The rest of the trail is a 7.3-mile ascent back out of the gorge on the return trail. You’ll see tunnels of rhododendron and other thick mountain foliage, a splashing stream, and high open meadows. The entire loop is 10.8 miles and the elevations range from 1,700 to 3,572 ft. A few small historic structures are visible along the trail, including a Civilian Conservation Corps camp. Grayson Highlands offers five loop trails throughout the park, ranging from 0.3-1.8 miles in distance. These trails lead to panoramic vistas, scenic waterfalls and a 200-year-old pioneer cabin. The park also offers access to the Appalachian Trail and the surrounding Jefferson National Forest. This 5.5-mile moderate loop into George Washington National Forest is not maintained and not suitable for dogs or young children. Strickler Knob does, however, reward with challenging rock scrambling and stunning 360-degree views of New Market Gap and the Luray Valley. The Lake Keokee Loop Trail circles Lake Keokee, which is a popular fishing lake near Big Stone Gap. The 3.7-mile, moderate loop features both land and water wildlife. Two trails lead to the falls creating a 1.5 mile loop trail. Most visitors use the Streamside Trail on their way up to the falls and return on the Woodland Trail. On the Streamside Trail, hikers are treated to rustic stone bridges, sheer rock faces and the sound of tumbling water as they walk alongside Roaring Run Creek up to the falls. The trail junctures with the Woodland Trail just shy of Roaring Run Falls. A short, 0.10-mile spur trail leads to the falls. The woodland Trail travels through the forest, passing a scenic overlook and the iron furnace before returning to the picnic area. Both trails are easy with relatively little elevation gain. This would be great with a map of VA with these points highlighted in some way. 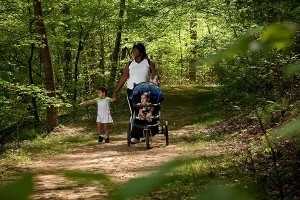 I love to see stroller-friendly hikes posted, and one of these seems to be just that, judging by the picture. But in researching the South River Falls trail online, it does not seem stroller-friendly. Great post! I must add these to my AllTrails app and get to hikin’!